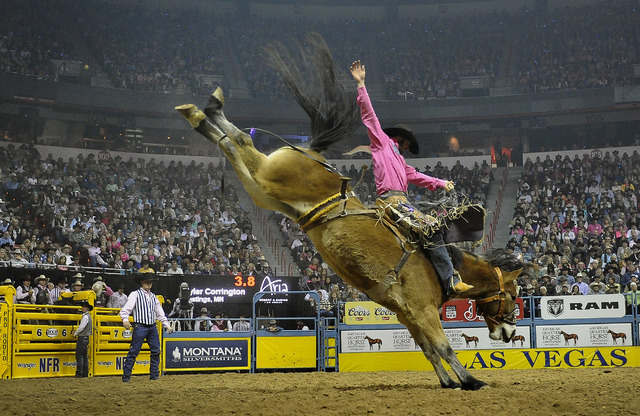 As the toughest cowboys and girls from across the country make their way to Sin City this week to compete in the National Finals Rodeo (NFR) here are five facts about the world’s richest rodeo that you may not be aware of. In order to house all of the competitors, a crew of 175 put in approximately 28 hours to transform the Thomas & Mack Center from a basketball arena to the home of the world’s biggest rodeo. The set-up requires the use of 2,500 tons of dirt, 1,500 metal panels and 250 bow gates and frames inside and outside the arena, officials said. 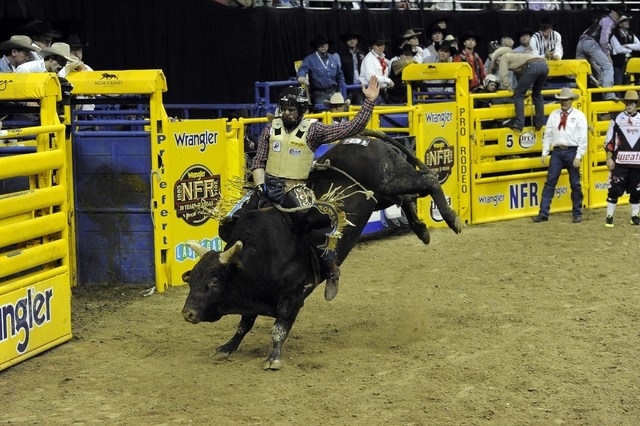 Much like the always-sold-out NFL Super Bowl, NFR has sold out 290 consecutive performances. According to the Professional Rodeo Cowboys Association, the economic impact of the 10-day rodeo is estimated at around $90 million annually. Last year, 177,565 rodeo enthusiasts decked out in Wrangler jeans, Justin boots and cowboy hats attended events at the Thomas & Mack with an additional 40,000 fans who watched at the 40 hotels who hosted watch parties. It’s also one of the only times of the year that you will see marquees across the Strip flashing the names of the “toughest” bull riders and barrel racers rather than nightclub DJs. Over the course of the 10-day festivities at the arena, NFR fans consume an estimated 75,000 beers, 15,000 bottles of water, 26,000 sodas, 5,000 pizzas, 4,500 nachos, 6,800 hot pretzels and 7,000 bags of popcorn, officials said. Along with the hundreds of thousands of people that flock to Las Vegas, the event also brings almost 700 animals to town — 300 bucking stock (horses and bulls), around 120 horses ridden in the timed-events, 150 steer, 75 calves and about 50 more horses that are used by contestants in the nightly Grand Entry, as well as flag girls, pickup men and steer wrestling hazers. The five acres behind the Thomas & Mack Center are turned into a small ranch complete with stock pens. Led by a Professional Rodeo Cowboys Association Board member, a team of 11 people is tasked with making sure every single animal receives top of the line care while they’re staying at the Thomas & Mack. In 1985 when the rodeo moved from Oklahoma City to Las Vegas, the prize money awarded to competitors totaled $1.79 million. Under the terms of a new 10-year contract, the participating cowboys and cowgirls will now be competing for $10 million. This increase in prize money helped Las Vegas beat out strong bids from Dallas, Texas and Kissimmee, Fla.
Over the past 30 years NFR has been held in Vegas, it has paid out a total of more than $172 million in prize money to contestants and compensation to stock contractors, an official told the Review-Journal. When the NFR first touched down in Las Vegas, the city boasted 53,000 hotel rooms and attracted over 14 million visitors. Now, there are currently more than 150,000 hotel rooms and the city attracted a record 41.1 million visitors in 2014. Along with being kept safe by 24-hour security on the “ranch,” officials said, each animal that is set to participate in an event is inspected by rodeo judges before the night’s competition. If an animal is found to have a health issue, it is immediately pulled from the line up. 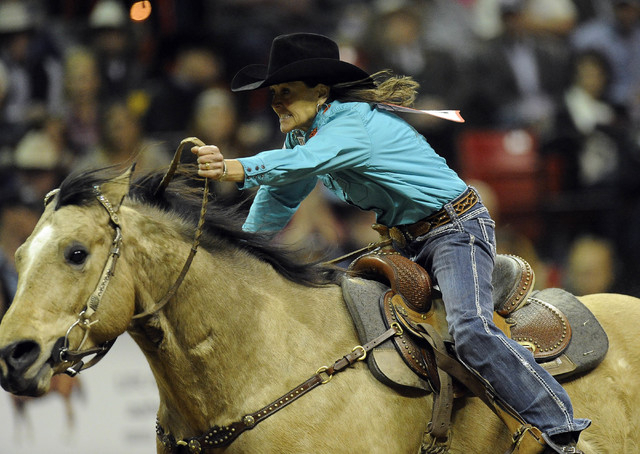 From the tie-down roping steers to the horses, the animals participating in NFR receive top-of-the-line care. Due to the tie-down roping calves being more fragile and susceptible to the elements than some of the bigger and tougher, a tent was added to the rodeo grounds to give them more specialized care. Steer used for team roping are fitted with horn wraps to protect their horns from the headers’ ropes. These team roping steer wear the horn wraps throughout the duration of the rodeo. Not only do contestants in timed events have different horses to compete with based on the type of arena they’re performing in, but they also travel with their own private veterinarians to care for their horses, an NFR spokesperspn said. The animals are also treated to mud and ice packs on a routine basis, provided with specialized feed, equine massages, chiropractic services, and hydrotherapy in pools.